Bummer. I didn't find any 1970's overalls or denim jumpsuits at Saver's yesterday, but I did pick up four lovely new additions to my closet. Me: Look what I got at Saver's today! 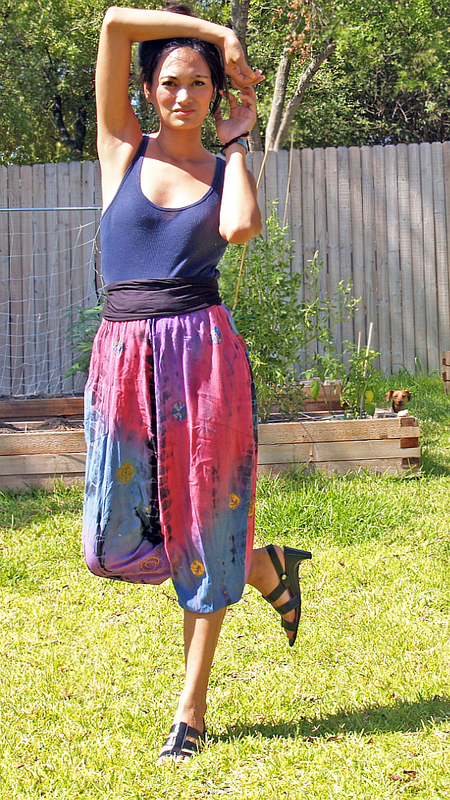 Harem pants (holding up pants)! Husband: Um, did you say harem or hammer pants? Me: (inspecting the very low crotch) Uh... same thing? occasion: selling some items at Buffalo Exchange, shopping for a present downtown. The pants are insanely comfortable, but I'm not in love with them, yet. I love the pockets on the side, but truth be told, I may be marching these down to Buffalo Exchange in the next month or so, unless an Adored Austin reader wants to try to rock 'em. Let me know! For now, I'm going to wear these out and about and see what other (less fashion oriented) people think of 'em. I hope no one laughs at me or does the "Too Legit to Quit" sign. Wait a second... what am I saying?! No... I HOPE someone does the "Too Legit to Quit" sign. That would be phenomenal! If this happens, I will wear these pants weekly!